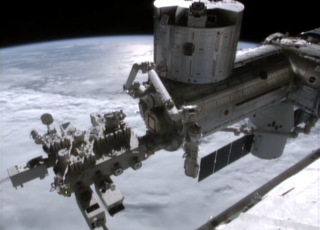 Astronauts on the U.S. side of the International Space Station (seen here) were evacuated to the Russian segment of the orbiting outpost on Jan. 14, 2015 after an alarm that could indicate an ammonia leak sounded on the station. There is no hard evidence pointing to an actual ammonia leak at this time, however. An alarm suggesting a potentially toxic ammonia leak on the International Space Station early Wednesday (Jan. 14) forced astronauts to evacuate the U.S. side of the orbiting lab, but NASA says there is no proof such a scary leak actually occurred. It might have beeen a false alarm. The station's six-person crew, which includes two Americans, three Russians and an Italian astronaut, took refuge in the station's Russian-built segment, isolating themselves from modules built by NASA, Europe and Japan due to the leak alarm at 4 a.m. EST (0900 GMT). NASA astronauts Barry "Butch" Wilmore, Terry Virts and European Space Agency astronaut Samantha Cristoforetti are all "safe and in good shape" with their Russian crewmates, NASA spokesperson Rob Navias said during a NASA TV update today (Jan. 14). Flight controllers for the International Space Station have not found any hard data showing proof of an ammonia leak. Isolating the crew in the Russian segment with cosmonauts Elena Serova, Alexander Samokutyaev and Anton Shkaplerov is a precautionary measure, Navias stressed during the broadcast. "The data that is being analyzed by flight controllers here in Houston at the moment is increasingly more indicative of a sensor issue or computer relay data issue of some sort, but not a leak itself," Navias said. "Outstanding news," Wilmore said when astronaut James Kelly radioed the news from Mission Control in Houston. "Great work, and we'll be ready to do what you need us to do when the time comes." The alarm was triggered by an increase in pressure in the water loop for one of two redundant space station cooling systems, Navias said. That pressure change could have been indicative of an ammonia leak. Mission Controllers are now working to make sure that the U.S. side of the station is safe before allowing crewmembers to roam through all modules of the International Space Station. Ammonia is a toxic substance that can cause major health problems if breathed in. The crew will probably remain in the Russian segment for at least the rest of their day, but they have more than enough food to provide for all six crewmembers, Navias said. The space station has approximately the same living space as a five bedroom house and has been continuously occupied by rotating crews of astronauts and cosmonauts since 2000.